For fast, easy, inexpensive mounting, without the mess of glues or sprays. 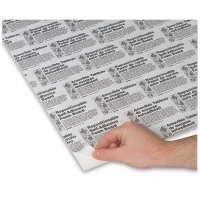 Just peel off the easy-release, protective liner to expose the pressure-sensitive, medium-tack adhesive. Quick Stik Foam Board allows for repositioning before pressure is applied. Just like standard foam board, it's lightweight and rigid, and it cuts easily with a knife or razor. Adhesive is pH neutral. 3/16" (5 mm) thick, white sheets.